You can’t just put caesar salad dressing on some lettuce and call it caesar salad. It takes a bit more care than that. Not much more care, but a bit. Use this very simple caesar salad recipe to make a proper salad, okay? It doesn’t take much, but you’re going to need a head of romaine lettuce, some croutons and some caesar salad dressing. You will also need fresh parmesan cheese. Not “parmesan cheese” powder in a container. A fresh brick of parmesan cheese. Bacon is optional. But use bacon. It’s a salad, just make it. Wash your romaine lettuce and then chop or tear it into little bits. Chopping is quick, but tearing doesn’t dirty a knife. Put that in a bowl and grate a whole bunch of parmesan cheese into it. Toss the salad greens with about half of a cup of caesar salad dressing. Top with freshly cooked bacon chopped into bits to make your salad actually good. Or, if you want to try something completely messed up and amazing, you can make a bacon weave and use it as a salad shell. A salad wrapped in bacon is probably not actually a salad anymore, but that’s okay. It’s great. 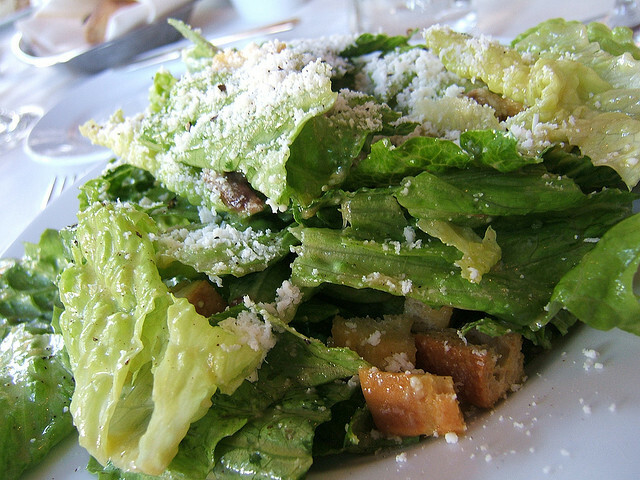 Come back or sign up to our e-mail newsletter for upcoming recipes for homemade caesar salad dressing and croutons. Quantities on this recipe would have been nice.